Imagine if The Play occurred in this Saturday's Cal-Stanford game, rather than 25 years ago. In this age of relentless sports coverage, ubiquitous bloggers and inexhaustible opinion, The Play would cause so much debate, controversy and outrage that the World Wide Web might actually fill up. ESPN would have to add yet another channel, and even those tree-sitting protestors at Cal would climb down to call into radio talk shows. "Moonbeam in Berkeley -- you're on with Frank the Tank and the Coach." "Hey, yeah, I just wanted to say that, apart from its fascist plan to destroy a vital ecological habitat of moderate-growth trees in order to build a $125 million athletic facility for a sport that promotes violence, demeans women and leaves a destructive carbon footprint, Cal football rules! And Stanford should just shut the @#&% up! I had a clear view of The Play from the top of my tree, and Dwight Garner's knee was soooo not down! Some of the differences between 1982 and now are positive. Multiple daily "SportsCenter" broadcasts, plus YouTube, would give fans 24/7 access to video highlights, inspired simulations and parodies of The Play. As it is, even though The Play occurred 25 years ago, I found 23 versions of it on YouTube, including this one and this one. That's 23 more versions than were available to me in 1982, when I spent my entire shift at work that night frustrated that I couldn't find one friggin' highlight of The Play on any of the seven TV channels available. 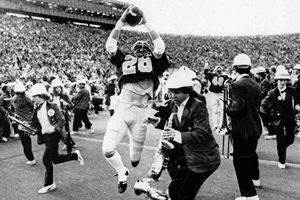 Cal's Kevin Moen leaps with the ball in the air after scoring the winning touchdown back in 1982. But other differences between 1982 and now are largely negative -- particularly instant replay. Nowadays, officials would review replays of The Play for so long that before they reached a verdict, Silicon Valley engineers would have developed another digital recording system that Microsoft and Apple would make us purchase in order to further analyze the decision. And then the refs would undoubtedly overrule The Play -- with more than two dozen players from both teams on the field, plus more than a hundred band members and cheerleaders, a replay official surely would find something objectionable -- and ruin the greatest play in college football history. With today's video technology, we could review The Play from a dozen angles and use computer enhancements until we felt certain whether Dwight Garner's knee was down or if Mariet Ford's lateral really was backward. But, chances are, neither side would go away happy with the result. That's because it's an indisputable fact that replays go against your team 95 percent of the time. I can't explain how this can be true for every single team. But then again , I can't explain how my Slingbox lets me watch TV on my laptop from thousands of miles away, either. All I know is, it's true. A quarter-century later, former Stanford trombonist Robert Smith can laugh about playing a small part in the craziest play in college football history. But it wasn't so funny at the time. "The whole next few hours were painful," says Smith, now a software engineer for ESPN Mobile in Seattle. "Cal fans came up and congratulated us. Driving past the fraternities on the bus home and having the frat guys cheering us was not the most pleasant trip of my life." Smith vividly recalls marching onto the field under the assumption that his school had just won, thanks to a dramatic drive by senior quarterback John Elway and a last-minute field goal. And then things got crazy. "I remember seeing some football players running by me and wondering, 'Why are there football players chasing after each other? There must be a fight.' "
It wasn't a fight. And Stanford hadn't won. And ... well, you know what happened. Despite the band's infamous role in The Play, Smith says he didn't feel any animosity from Stanford fans. "I never heard any vitriol from any student, with the exception of reading a quote from a player in the media. This is Stanford we're talking about, not Ohio State. There is no expectation we would actually win." He still gets asked about The Play. "It's one of those things where other people who know about it bring it up when they're introducing me," he says. "It's a tremendous calling card. We're more than willing to exploit the memory of it. All of us trombone players were issued football helmets the next year. My only photo in Sports Illustrated was me and three or four others wearing football helmets at a game." And 25 years later, how does he feel about The Play? "Given that it happened, I'm glad to have been part of it," Smith says. "But I would rather have won the game. We still blame the referees." Nineteen percent of all replays show that your quarterback's arm was not going forward when the ball came loose. Seventeen percent show that your receiver was not inbounds when he caught the ball. Fifteen percent show that your player fumbled the ball before his knee touched the ground. Twelve percent show that the pass was complete before your receiver fumbled the ball. Eleven percent show that your receiver never had possession of the ball and the pass was incomplete. Nine percent show that your player threw a backward lateral, not an incomplete pass. Seven percent show that the onside kick touched one of your players first before the receiving team fumbled it away. Six percent show that your player did not break the plane of the end zone. Five percent show that your player stepped out of bounds at the 1 before reaching the end zone. And yes, I know -- all that adds up to more than 100 percent. But that's the horror of instant replay. It defies all logic. Worse, instant replay is just one more depressing sign of our litigious society. When something goes wrong, we no longer just accept it and move on. We have to blame someone. We insist on finding a judge to review the injustice. We demand restitution. But football is a game, not a court of law. And if you try to achieve perfection, you lose something more important. The beauty of sport is that it is played by humans, not computer programs. We are imperfect. We make mistakes. We fumble the ball, drop passes and trip over our own feet when there is nothing but open field ahead. 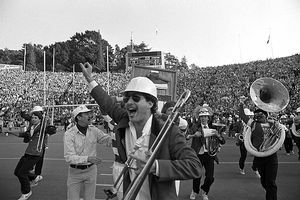 And sometimes, Gary Tyrrell runs onto the field with a trombone. That's what makes the game unpredictable. That's what makes it compelling. That's what makes it fun. And if the ref occasionally gets a call wrong? That's fine. This is sport, after all. Not a space shuttle launch. Hey, as an old Vikings fan, I'd have loved it if head linesman Jerry Bergman and field judge Armen Terzian had correctly called offensive pass interference against Cowboys receiver Drew Pearson on the infamous Hail Mary play in the '75 playoff game between the Vikings and Cowboys. But in all honesty, I've probably gotten more pleasure out of ranting about that play the past 32 years than I ever would have had the Vikings actually won the game and gone on to the Super Bowl (which, naturally, they would have lost). The members of the Stanford band will never forget The Play. Pictured here are Bill Martin, Lou Casagrande, Rob Smith and Dave Adams. So, 25 years later, does it really matter whether Garner's knee was down or whether Ford's lateral was indeed backward? No. What matters is that a group of trained, dedicated referees followed The Play that day as best they could, and they ruled on it as fairly and honestly as possible. And, aside from a few bitter Stanford fans, we're all the better for it not being reversed -- so that we have the memory of that incredible play, the greatest play in college football history. (And frankly, those Stanford fans probably shouldn't care either, because most of them made a killing during the tech boom and currently are retired and dining on Komodo dragon filets on their private islands in the South Pacific). So, as we prepare for another Big Game between Cal and Stanford a quarter-century after The Play, let's pause to celebrate the fact that the only use of its replay has been to repeatedly place smiles on the faces of fans across the nation. Jim Caple is a senior writer for ESPN.com. He can be reached here. His Web site is jimcaple.net, with more installments of "24 College Avenue." His new book with Steve Buckley, "The Best Boston Sports Arguments: The 100 Most Controversial, Debatable Questions for Die-Hard Boston Fans," is on sale now.